SRS components are located in this area. Review the SRS component locations (see page 24-21) and the precautions and procedures (see page 24-25) before doing repairs or service. 2. Recover the refrigerant with a recovery/recycling/ charging station (see page 21-80). 3. Disconnect the A/C line from the evaporator core (see page 21-67). 4. When the engine is cool, drain the engine coolant from the radiator (see page 10-6). 5. From under the hood, remove the clamp (A). Slide the hose clamps (B) back. Disconnect the inlet heater hose (C) and the outlet heater hose (D) from the heater unit. Note the layout of the hoses. Engine coolant will run out when the hoses are disconnected; drain it into a clean drip pan. Be sure not to let coolant spill on the electrical parts or the painted surfaces. If any coolant spills, rinse it off immediately. 6. Remove the mounting nut from the heater unit. Take care not to damage or bend the fuel lines or brake lines, etc. 7. Remove the dashboard (see page 20-183). 8. Disconnect the connector (A). 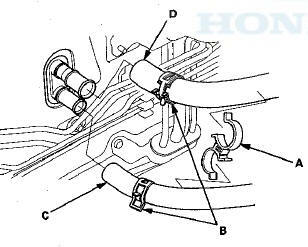 Remove the clips (B), ducts (C), and the drain hose (D). Then remove the mounting bolt, the mounting nuts, and the blower-heater unit (E). 9. Remove the two screws, then remove the cover (A). 10. Disconnect the connector (B) from the blower motor. Remove the wire harness clip (C). 11. 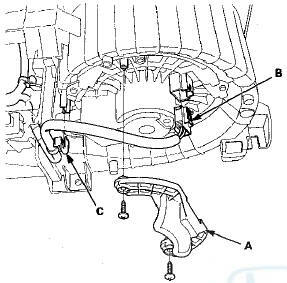 Disconnect these connectors (A): The mode control motor, the power transistor, the evaporator temperature sensor, the passenger's air mix control motor (with climate control), and the recirculation control motor. Remove the wire harness clips (B). 12. Disconnect the connector (A) from the air mix control motor. Remove the wire harness clips (B), the connector clip (C), and the wire harness (D). 13. Remove the self-tapping screws and the passenger's heater duct (A). Remove the self-tapping screws and the expansion valve cover (B). Remove the self-tapping screw and the heater core cover (C). Remove the self-tapping screws, the heater pipe bracket (D), and the grommet (E), and carefully pull out the heater core (F). 14. Install the heater core and the evaporator core in the reverse order of removal. 15. Install the heater unit in the reverse order of removal, and note these items: В© Do not interchange the inlet and outlet heater hoses, and install the hose clamps securely. вЂў Refill the cooling system with engine coolant (see page 10-6). вЂў Make sure that there is no coolant leakage. вЂў Make sure that there is no air leakage. 16. Do the battery terminal reconnection procedure (see page 22-91).